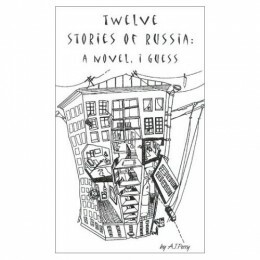 A. J. Perry’s twelve stories are ‘told’ on paper in a diary-confession fashion, saturated with those witty and hilarious, comical observations of his, along with the broad cultural views of the author, too steeped in humor— and his many philosophical perspectives on life. The book gives an insight into the life in Russia of the beginning of the 1990s, as it can be quite fairly regarded and truly considered a different country from the one it has now become. Through the eyes of a foreigner, a dialogue between cultures is provided, illustrating the manifold stereotypes about the American and Russian cultures alike—in a manner so humorous—that makes the reader (no matter how serious) smile involuntarily. Following a man from ‘there’ in search for change ‘here’, a modern (Russian) reader will re-discover the harsh life of the 1990s for him/herself, presented in a somewhat comical yet deeply-observational way. The characters are typically Russian and naive, with stereotypical Russian names: several Olgas, Tanyas, Vadim and Boris — James’ best friends. The journey begins when an American man (James a.k.a. A.J. Perry) with a stable (yet somewhat boring) American life (boring enough, that is, to flee a safe country to the perestroika-aftershock-experiencing nation) makes a decision to escape its safety and comfort by flying… to Russia. From his life-altering meeting with a German man on the board of the plane, the seemingly unremarkable finding of the muddied two-kopeck coin — the presence/absence of which in his wallet will quite symbolically mark his fateful decision to finally leave Russia (the point of exhaustion of his mission) — and the 11 encrypted yellow words he is yet to uncover, the reader will follow his each and every step in and outside of Russia, his every line, hooked to read on. Yet, by the end of the book, the mystery of the eleventh word remains unsolved, to be uncovered; indeed, it stays beyond the author’s grasp, unreachable, elusive, left for the reader to find out. All in all, the reader will most likely find the book most enriching, light and entertaining yet captivating from the very first lines. As for me, I’ve enjoyed the intercultural journey of the main character to the fullest, diving into his inner world—in the meantime rediscovering Russia ‘which is yet to become Russia’ from a totally different perspective—gaining a bicultural standpoint—seeing it in an ultimately new light. Needless to say, this highely unlikely intercontinental journey-through-time, it has tought me a lot. So it could teach you. If you only decided to open up your mind to it, setting out on a trip back to… (no, not the USSR, rather) the RSFSR, discovering the era of the post-Soviet 1990s through the lens of a New Worlder. Take this chance, for this might truly be a once-in-a-lifetime opportunity.